Note: If you attended the live CE activity AND received CE credit (i.e. a pharmacist CE statement of credit with ACPE UAN 0221-0000-18-384-L01-P), you are NOT allowed to also receive credit for this home-study on-demand web activity. 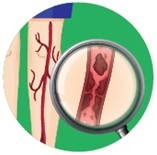 Each year an estimated 100,000 Americans die as a result of a venous thromboembolic event (VTE). Identifying patients who benefit from VTE prophylaxis, assessing the need for extended VTE prophylaxis, and monitoring for adverse effects are key areas that pharmacists can intervene to improve the quality of patient care. This activity will provide pharmacists with an improved foundational knowledge of VTE, risk stratification outlines, and oral anticoagulant options for use. A focus on addressing challenges during transitions of care will be presented, along with strategies to reduce patient non-compliance with therapy post discharge. Identify the risk of venous thromboembolism (VTE) in acute medically-ill patients following hospitalization. Outline strategies to incorporate clinical practice, quality measures, and performance metrics into patient care to minimize risks and optimize outcomes of anticoagulation therapy. Differentiate the clinical evidence for oral anticoagulant agents for prevention and treatment of VTE by indication, efficacy, and safety. Outline steps to risk stratify medically-ill patients for extended VTE prophylaxis. Describe successful VTE prevention strategies for care transitions, including tactics to reduce medication errors, improve prophylaxis post discharge, and overcome barriers to adherence. ProCE, Inc. is accredited by the Accreditation Council for Pharmacy Education as a provider of continuing pharmacy education. ACPE Universal Activity Number 0221-0000-19-049-H01-P has been assigned to this home study knowledge-based activity (initial release date 1-18-19). This activity is approved for 1.5 contact hours (0.15 CEUs) in states that recognize ACPE providers. The activity is provided at no cost to participants. Participants must complete the online post-test and activity evaluation to receive pharmacy CE credit. Statements of completion will be issued online at www.ProCE.com and proof of completion will be posted in NABP CPE Monitor profiles. No partial credit will be given. It is the policy of ProCE, Inc. to ensure balance, independence, objectivity and scientific rigor in all of its continuing education activities. Faculty must disclose to participants any significant financial interest or affiliation with companies that manufacture or market products discussed during their presentation. Mr. Fanikos is a Speaker for Genentech, Inc. Dr. Mahan is a Speaker and/or Consultant for the American College of Emergency Physicians, Bristol-Myers Squibb, Janssen, Medscape/WebMD, Pfizer, Pharmacy Times and Portola. Dr. Sylvester is an Advisory Board member for Bristol-Myers Squibb and Pfizer. A portion of grant funds received by ProCE from Portola Pharmaceuticals, Inc. will be used to compensate the faculty for this presentation.